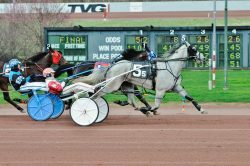 Wilkes-Barre, PA — The American Ideal mare Ghosttothepost became the only distaffer to be victorious in all three preliminaries of the Bobby Weiss Series for pacing fillies and mares, coming home in :56.2 on a cold Monday (April 15) with swirling winds at The Downs at Mohegan Sun Pocono to triumph in 1:54.3. Ghosttothepost swept her preliminary Bobby Weiss Series events with a 1:54.3 win on Monday at The Downs at Mohegan Sun Pocono. Curtis Salonick photo. George Napolitano Jr. got early fractions of :28.3 and :58.1 with the five-time seasonal winner, then turned on the jets late with a :28.2 third quarter and then a :28 last quarter to seal the win. Ghosttothepost, who suffered broken equipment during the contest, needed the speedy finish to keep pocket-sitting Cardiff a neck away at the finish for trainer Darren Farrell and owner Peter Paul Venturini. Ashlee Sparkles, who came to her third Weiss prelim with a pair of series victories, this could not catch the Sportswriter filly Girl’s Got Rhythm, who clocked splits of :28.2, :57.2 and 1:25.3 before holding off Ashlee Sparkles by a length in 1:54. Girl’s Got Rhythm was unraced as a freshman but began her career with three straight victories, including one previous Weiss win, for driver Tyler Buter, trainer Nicholas DeVita and owner John Cummins. Charms Little Sis lowered her record 4-1/5 seconds when she won the other Weiss cut in 1:55.2, giving Buter victories in two of the three series divisions. Charms Lil Sis, a Mach Three mare, also used front-stepping tactics en route to the winners circle, opening a big lead up the backstretch and staying three lengths clear at the finish for trainer Scott Blackler and the Millar Farms. The $30,000 Weiss final for this group will be featured next Monday (April 22), with a $15,000 consolation also to be available if enough horses enter. The unofficial top nine in the standings (in order) after this group’s preliminary round action are: Ghosttothepost, Ashlee Sparkles, Cardiff, Girl’s Got Rhythm, Final Escape, Charms Lil Sis, Flippin Fun, Linda Lace Hanover and JK Lockherup. Anthony Napolitano and Simon Allard won four races each on the 14-race card, while Buter won three. Anthony Napolitano combined with trainer Jose Godinez to capture the early double; Simon Allard teamed up with his brother, trainer Rene Allard, to sweep the late double; and Buter’s hat trick brought him to 2,998 career driving wins.